This widening gulf between the haves and have-nots has been a consistent trend for a generation or more. Economists largely agree about the primary underlying reasons. New technology has made many jobs obsolete, while creating dramatic opportunities for wealth in computers, finance, and media and entertainment. Global competition has done the same. As middle-class assembly-line jobs vanish, and routine white-collar work gets outsourced overseas, the value of education and special skills rises. The power of unions continues to decline. For people in the broad middle class, the economic picture over the past decade has been mixed. Unemployment has been low and inflation largely contained. But behind those reassuring trends, you'll find a lot of volatility in labor markets — what economists call "churn." In short, there's more hiring and firing going on. That churn had led to new opportunities for many workers, but caused hardship and anxiety for many others. Add to this the fast-rising cost of health care and the decline of employer-paid pensions, and you understand why many middle-class families describe themselves as financially squeezed. Low-income Americans, of course, are financially squeezed as well, only more so. seems like if there every was some sort of UNFORSEEN catastrophe..the situation would only become more bleak and volataile. 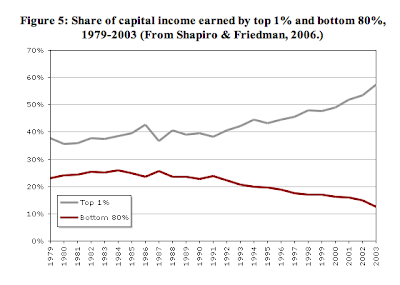 If America want's to be a meritocracy instead of a plutocracy we need a little more populism. Too bad about all the apathy. If the rich wan't to stay rich without having to eventually resort to martial law, they probably need to give back something to all those little people that made it happen. maybe start with healthcare...eh ? I wish the "churn" would head in my direction. I could sure use some hiring. And I think health care would be the most effective means. No one wants to support those who leach off society, but the problem is that many people who would otherwise be working, but happened to get injured, lost work, got fired, and now have enormous debt... they're now a drain on the tax payers. They want to work, but they can't because they lack the health care. It's a good means of separating out those who would work and those who try not to. I have a masters degree. I want to work very much. I have the skills, am intelligent and adaptive, but if I broke my leg or something I would be screwed for the rest of my life because I don't have health insurance and can't afford it. If we offered universal health care the people who are currently on welfare and wanted to work could do so, and we could make serious cuts on the welfare program thereby actually saving the tax payers money. Why are we the only industrialized nation that doesn't have some form of universal health care? According to Allan Greenspan, this is the greatest concern to America in the near future. 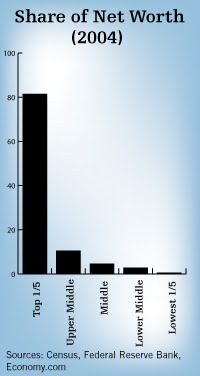 Of course, there's difference between the statistics presented by the graphs and the statistics of the locality. New York, for instance, is experiencing an economic decline and fewer companies are hiring. "The churn" is not occurring here because companies are afraid to hire new employees. I'm not advocating communism or something..but c'mon. Is this a Nation-State or a really large and cleverly disguised Feudal Domain. It would actually be a great long term INVESTMENT on the part of the top fifth to put some money back into the machinery that produced it. That's what you do with any business, re-invest profits for continued growth. America needs to do some soul searching. Where do the evangelicals weigh on on health care ? I mean they're among the poor..one would think they'd be supportive of these types of ideas that are about helping and loving your fellow man. I'm not asking for complete equality of wealth. But something a little more reasonable. Good luck in NY man...that's why I never moved there. You pretty much need a trust fund to even get STARTED in that city. 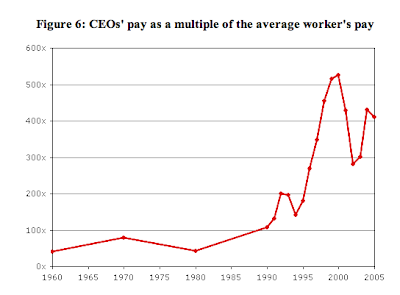 The feudal structure of the corporation transfers the majority of wealth, and therefore power, to the CEO. And the size of the corporations gives them a much greater impact... they've got most(if not all) of the politicians in their pockets. Let alone the fact that most of the news sources are owned by very few corporations, so all of our information is biased and cannot be fully trusted. Which further negates the democratic process. I agree, it would seem rational to reinvest in one's company and it would also seem rational that workers who feel like they are being justly compensated and fairly treated will work more efficiently and productively. But sadly, these businessmen are so concerned with immediate gratification they can barely see their hand in front of their face, much less what lies ahead of them on the road. Stupid bastards. This is one of the things that has me interested in Barak Obama. He has entirely funded his campaign by private donors, meaning individuals. Whereas all of the other candidates have derived most of their funding from corporate donors.